These activities are designed to help learners attend to more than one direction at a time. While they are British-speaking teachers, the activities are too compelling to ignore. They help learners lengthen their sentences by adding antecedents (“Due to the rainstorm”). 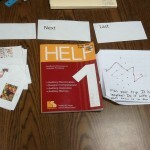 They help learners lengthen their sentences by adding more descriptive words. They help learners see a sentence as a complete thought. They build working memory, as you hold one phrase in mind while searching for a phrase to add to it. They build expressive language by helping learners practice it. I’m retiring, but the blog stays. I’m losing my class…Not figuratively. After teaching for 13 years in Pittsford and 29 years at Harley, I’m stepping out. I have four grandchildren who would still think a full-time Bompa would be fun, and I have a great sidekick/wife, Pam, who’d like to adventure with me. Trips are more easily taken when you don’t have to spend $2000 on school vacations for two economy seats to Boise ($700 off-peak). My already-retired friends in Old Forge, TN, NC, and FL want to show us the good life, and we’ve put them off for long enough. I’ll never completely leave Harley; I plan to volunteer, consult, and do some video. I plan to keep my blues garage band (we practice once a week), and keep my job with www.drafttek.com as Buffalo Bills Analyst and editor. I plan to consult with Geneseo about an apprenticeship model for student teachers. I’m making a book pile, too! I intend to keep my blog going until I run out of ideas. My mind still wakes me up at 3:30 am pretty often, so that won’t be soon. When working with 4-7-year-olds, I try to do three things in a 30-minute session, and time concepts aren’t great yet. They need to see what’s happening. It allays anxiety, lays it out spatially, and helps build a better concept of time. The “First”, “Next”, “Last” cards, with a representation of what we’ll be doing first, next, and last that day help do that. 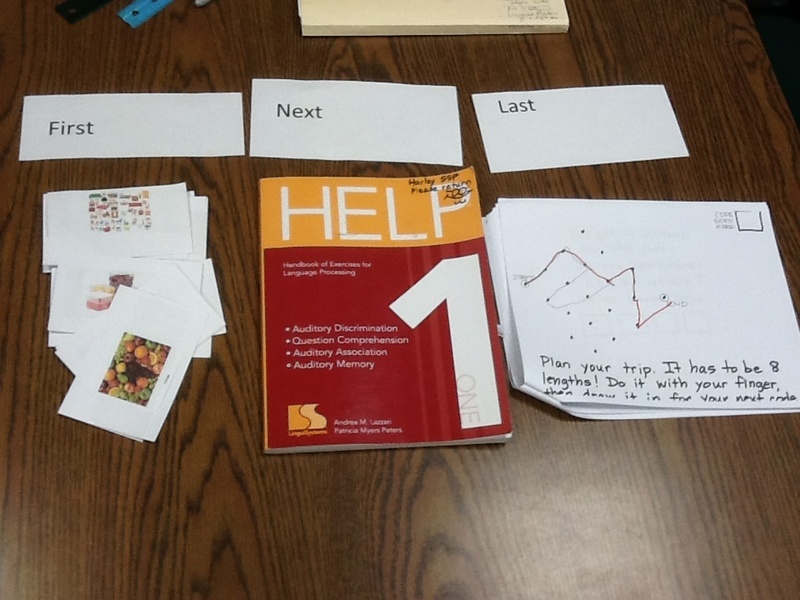 Pictures of the three tasks would also work, and the pictures could live in the child’s folder for quick setup. I don’t sleep well because I don’t take the time to relax my brain before bed. I seem to do the exact opposite, surfing through Twitter like I’ll find something. When I think back to vacations where I have been the most relaxed, it’s when I’m at the ocean. The repetitive rolling of the waves is like God’s calming breath. Here is the ocean, my new favorite go-to-sleep sound, and 11 hours is long enough for all night! Here is a second ocean one, also 11 hours long. Irregular verbs can really make a teacher feel out of sorts. If you have a student who says “She sitted in my seat”, then you’re at risk for this irregularity. Here are some websites I’ve found that may be just what the doctor ordered! Feel better soon! www.zooburst.com – build a pop-up book, with page turns. http://www.microsoft.com/windowsxp/using/digitalphotography/photostory/default.mspx - Photo Story 3 (from Microsoft) – for story telling. Slightly complicated to download, as you need to download something else as well. www.Sync.in - the new, better Etherpad. No need to save after you’ve added your comments; just exit. https://join.me/ – conferencing site, cross-platform collaborations. This could be happening during a faculty meeting with 5 groups all adding details, brainstorms, etc. to 5 topics –all at once. www.soungle.com – royalty-free sound effects. Just type the sound you’re looking for (F-16, snare drum). Click the play buttons to test them out and find the right one. Click download to download that sound. http://www.ipevo.com/Point-2-View-USB-Camera_p_70.html – $69 document camera that uses USB and is excellent (captures pix or video in 1600 x 1200) – I’ve ordered one to try out. www.prezi.com – create zooming presentations on an infinite canvas instead of PowerPoints. Phenomenal for end of book projects, showing a concept map, slide show, doing an “About Me” or VIP, etc. http://vozme.com/index.php?lang=en – Paste text into the window and it makes an MP3 audio of it for your website, your Word document, etc. –If you have a child’s or author’s book text, have it read to kids. Female voice is better. www.jaycut.com – web-based video editor—publish to website, record movies, text, SFX, on their servers for free. Mov and wmv files don’t work. Will try avi’s. www.SumoPaint.com – photo shop for the rest of us, access from anywhere, use for Lines of Symmetry, Fractions, Will turn pic into sphere! http://keepvid.com/ - Be able to save a Youtube video you’ve found for classroom use. Handy “KeepIt” button you drag to your toolbar and click the button when you’re watching a video you want to show to class. http://www.synchtube.com/ - create a “room” in which you and up to 50 students can watch the same Youtube or Vimeo at once. http://www.tubechop.com/ - Chop up a Youtube video to just the part you want. Useful for “How would you end this?” Writing assignments. http://www.paperrater.com - does grammar check, plagiarism detection, etc. If reading is sort of tough for you, why not read better books, recommended by kids like you who have trouble reading fast or reading perfectly? I have added to this list each time a kid in my class or summer camp has recommended a cool book. By the time you get to third and fourth grade, you aren’t supposed to be perfect and know everything. But you ought to get better at asking for the kind of help you need. “I need help” was okay when you were younger, but now you need to be specific about how the teacher or friend or parent can help you. • It’s okay to ask for help. Don’t be embarrassed, and don’t worry about other people judging you. • Think of what might happen if you don’t get help. Think what might happen if you did get help! • Decide what the problem is and what kind of help you need. • Who can you ask for help? Choose someone you trust and who will know how to help you. • Think about what you’ll say when you ask for help (the words you might use are listed on the next page). Do it. • Remember, getting help when you need it is part of being responsible to yourself.